● Custer started fifth, finished fourth and earned seven bonus points. ● The Code 3 Associates driver led the first three laps until falling to third before a lap-four restart. ● Custer raced in third place for the majority of the stage and said the car felt loose into Turn 3 and wouldn’t turn well in the center of the turns. ● He pitted for four fresh tires, fuel and adjustments to improve handling and gained one spot on pit road. ● Custer started third, finished second and earned nine bonus points. 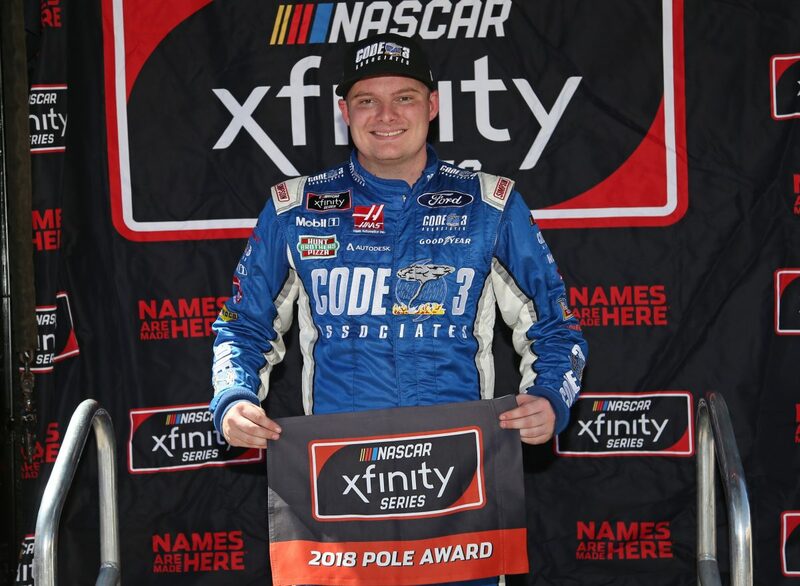 ● Custer raced the Code 3 Associates Ford in third place until a lap-64 caution. ● After experimenting with the low and high line, Custer found significantly more speed on the low line and advanced to second before the stage concluded. ● He pitted for four tires, fuel, chassis and air pressure adjustments when the stage ended. ● Custer started seventh, finished third. ● Before the final stage began, the No. 00 Ford team was handed a penalty for an uncontrolled tire, sending Custer to the rear of the field. ● Custer weaved his way through the field and entered the top-10 by lap 102. ● During a caution period on lap 124, Custer pitted for four tires, fuel and more adjustments. The Code 3 Associates pit crew’s quick stop advanced Custer to second place. ● Custer made the pass for the lead on lap 154, but tight-handling conditions sent him back to third. ● On lap 173, Custer came to the pits under green and the caution was called as he entered pit road. He pitted for two right-side tires in order to stay on the lead lap, then came back for two fresh left-side tires. He gained seven spots to restart in fourth place. ● After two more cautions were thrown, Custer restarted in fourth place and advanced to third before the race concluded. ● Custer earned his and Stewart-Haas Racing with Biagi-DenBeste’s fifth pole award of the season. ● This marks Custer’s 21st top-10 of the season and second at Las Vegas. ● This marks Custer’s 11th top-five of the season and second at Las Vegas. ● Custer earned 16 bonus points in the DC Solar 300 at Las Vegas. ● Custer led once for a total of three laps. ● Eight cautions slowed the race for 40 laps. ● Only 16 of the 40 drivers finished on the lead lap. ● Ross Chastain won the DC Solar 300 to score his first career Xfinity Series Victory, first of the season and first at Las Vegas. His margin of victory over second-place Justin Allgaier was 1.629 seconds.